Habitat: Desert, Upland. 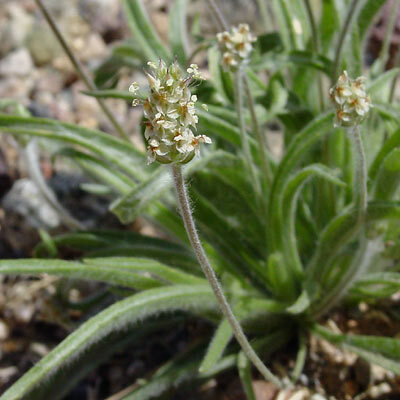 This plant grows in dry, sunny, open areas. Description: The flowers are on short, rounded, terminal flower spikes. The individual flowers have 4 round-ovate lobes and 4 stamens. The leaves are green, basal, and narrowly linear in shape. The plants are covered in fuzzy, white hair at right angles to the stems and leaves. 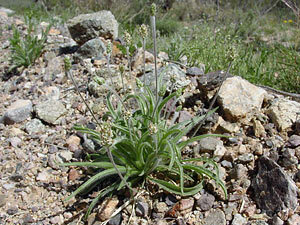 The similar Woolly Plantain (Plantago patagonica) has longer, thinner, greener, terminal flower spikes with smaller flowers. Edible – The mucilaginous seeds are edible and used as a source of soluble fiber known as psyllium.